One of the things the Fort Worth Stock Show and Rodeo's All-Western Parade is known for is its horse power. There were about a couple thousand of them in it, along with some donkeys and mules. "It just shows we are definitely the western town of Texas." said parade goer Jim Bossert. Horse owners and riders from all over the state and from Mexico took part in the parade. "We're just so proud they're able to be in the parade," said Briselda Villarreal, who's originally from Mexico. "Just to see all the horses and the cultural diversity is great." Tens of thousands of people lined the parade route. NO cars or trucks. Nothing with a motor in this one. Marching bands, carriages, covered wagons and buggies. "I'm just enjoying looking at all the different horses and everything with my son," said Demetrius Mattison whose son Brice was on his shoulders. "It's a great atmosphere and a great time to share with my kid." 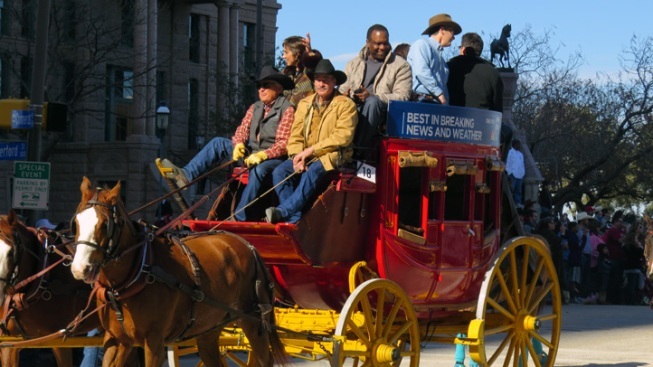 NBC 5 anchors Mark Hayes, Deborah Ferguson and Amanda Fitzpatrick as well as Meteorologists David Finfrock and Rick Mitchell rode a stagecoach in the parade. NBC 5 is a proud sponsor of the 2013 Fort Worth Stock Show and Rodeo. Click on this sentence for a complete list of events.